1*Thamizh Selvam N., 2Surabhi K.R., 3Sanjaya Kumar Y.R., 4Vasantha Kumar K.G., 5Sudesh Gaidhani N., 6Radhakrishnan P.
1Assistant Director-Biochemistry, Department of Biochemistry and Pathology, National Ayurveda Research Institute for Panchakarma, Cheruthuruthy. 6Assistant Director In-Charge, Head of the Institution, NARIP, Cheruthuruthy. Cheruthuruthy , Kerala- 679 531 India. Objective: Cardiospermum halicacabum Linn commonly known as ‘Balloon vine’ is a climber found in Western ghat region. The plant is claimed for medicinal properties and used by traditional healers of Kerala for treatment of various ailments. The present study has evaluated the antioxidant potential of C. halicacabum Linn Leaf in the atherodiet induced hyperlipidemic wistar albino rats. Materials and methods: The study comprised of six groups such as control group, test extract group, disease control group, treatment group low dose, treatment group high dose and standard drug group. The duration of the study was 28 days and the extract was administered in the animals as per the standard protocol. 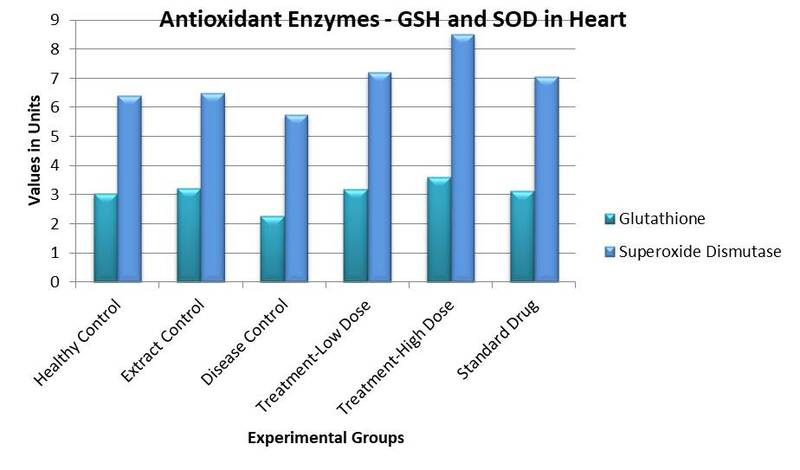 The antioxidant parameters such as Superoxide dismutase, Catalase, Glutathione and Glutathione peroxidise were evaluated in the blood and tissue samples of liver, kidney and heart. Results and conclusion: The study evidenced that the C. halicacabum leaf has significant antioxidant potential in blood and tissue level when compared with different groups. The role of free radicals in causing of various diseases such as cancer, atheroscelerosis, diabetes and other life style diseases have been well reported by scientific communities (Pawan et al., 2011; Harman, 1992). So, the studies related on scavenging of free radicals through antioxidants have become one of the core research areas in health science. All aerobic organisms including human beings have to counteract to auto-oxidation or peroxidation using antioxidant defence systems. The antioxidant molecules are obtained from the natural sources as part of food and some of them are also synthesised in the organism itself as part of natural defence against free radicals (3-5). The plants are considered as one of the richest sources of antioxidants and many plants have been reported for their antioxidant properties thatcontribute for their medicinal value. Cardiospermum halicacabum is a climber plant widely distributed in tropical and sub tropical regions of Asia and Africa. C. halicacabum is also found in farmland of Western ghat region as weed and used for various ailments by the traditional healers (6-8). In the present study the antioxidant potential of Cardiospermum halicacabum Linn Leaf was evaluated in the atherodiet induced hyperlipidemicwistar albino rats. The Chemicals and Reagents of make Transasia Bio-medicals India Ltd., Spectrum India Ltd, Merck India Ltd, Nice India Ltd, were used for the present experiment. Fully Auto Biochemistry Analyzer EM200- Make-Transasia and UV-Visible Spectrophotometer- Make- Agilent were the major equipments used for the present study. The plant Cardiospermum halicacabum was collected from the Western ghat Region (Palghat and Thrissur). The authentication of the plant was done by Taxonomist, Kerala Forest Research Institute (KFRI), Government of Kerala, Thrissur. Voucher specimen is maintained in the Biochemistry Department of NARIP, Cheruthuruthy. The leaves of Cardiospermum halicacabum were collected and used for the study. The Hydro alcoholic extract of leaf (one part alcohol and one part water) was prepared as per Ayurvedic Pharmacopoeia of India Part I Vol.VIII. Institutional Animal Ethics Committee’s (IAEC) approval was obtained for the animal experiments videProposal No. IAEC/NRIP/2015-16/05 dated 23.01.2016 in the meeting held at National Research Institute for Panchakarma, Cheruthuruthy, Thrissur, Kerala. Male and FemaleWistar Albino Rats in a test group were housed individually in standard polypropylene cages with top grill having facilities for pelleted feed and unlimited supply of drinking water in glass bottles with sipper tubes. An ideal temperature and relative humidity were maintained with a 12hr light / dark cycle. The animals had free access to sterile pelleted feed of standard composition and purified water. High fat diet or Atherodiet was prepared as per the method of Bopannaet al.,(1997) comprising of 2% Cholesterol, 0.25% Bile salts and 15% Butter were used for the present study. A total of 36 Wistar Albino Rats of 12 weeks old were randomized and equally divided into the 6 groups. Each group consisted of 6 animals (3Males and 3 Females) (Pillai et al., 2012, ThamizhSelvam et al., 2015). Control group received standard diet and distilled water, Test extract group received 250mg/kgbwt C. halicacabum extract and standard diet, Disease control group received only Atherodiet , Treatment group-Low dose received Atherodiet with 250mg/kgbwt C. halicacabum extract, Treatment group-High dose received Atherodiet with 500mg/kgbwt C. halicacabum extract and Standard drug group received Atherodiet with 5mg/kgbwt Atorvastatin (Patil et al., 2010, Adeneye et al., 2009, Hamden et al., 2009, Mariyappan et al., 2011,Maruthappanet al., 2010). The details have been briefed in Table 1. After 4 weeks treatment, body weights were measured and blood samples were collected by retro orbital route after overnight fasting of the animals for the study of biochemical parameters. 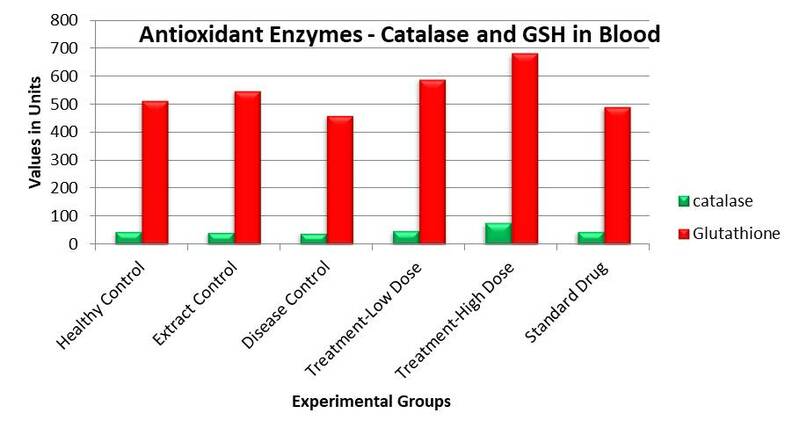 Blood samples were collected evaluation of antioxidant enzymes. At the end of the experiment, animals were euthanized and the organs were collected for the experimental purpose. Tissue Homogenization is a process used to prepare tissue samples.1g tissue was weighed and placed in the homogenizing cup. About 5ml phosphate buffer of pH 7.0 was added to the homogenizing cup and homogenized. Another 5ml quantity of same buffer was added and then homogenized. From this, 2ml of homogenate was transferred for the determination of Glutathione and the remaining part of the homogenate was centrifuged at 10,000 rpm for 20min at 40C. The supernatant was collected and used for the other enzyme assays after determination of protein concentration. Protein in the tissue and serum/blood were assayed using the Bradford’s test. The assay is based on the observation that the absorbance maximum for acidic solution of Coomassie Brilliant Blue G-250 shifts from 465 to 595 nm when binding to protein occurs. Accordingly the colour change was read at 595nm. Catalase was estimated by the method of Beers et al., (1952). 0.01ml of the tissue supernatant was mixed with 1.9ml of Phosphate buffer (0.5 M, pH-7.0) and 1ml of 11mM H2O2. Decrease in absorbance per minute was measured at 240nm for the first three minute against a blank which contained 0.01ml of the tissue supernatant and 2.9ml of Phosphate buffer. Glutathione peroxidase activity was determined according to the method of Hafemann et al., 1974. Tissue homogenate (approximately 0.5 mg protein) was incubated with 0.1 ml of 5mM GSH, 0.1 ml of 1.25 mM H2O2, 0.1 ml of 25mM NaN3 and phosphate buffer (0.05mM, pH7) in a total volume of 2.5 ml at 370C for 10 Min. The absorbance of yellow coloured complex was measured at 412 nm after incubation for 10 min at 37 0C against distilled water. A sample without the tissue homogenate was kept as control. The GSH was measured by the method of Moron et al., 1979.0.5 ml of the tissue homogenate was mixed with 0.1 ml of 25 % TCA and kept on ice for few minutes. This was then centrifuged at 2500 rpm for 5 minutes to settle down the precipitate. 0.3 ml of the supernatant was mixed with 0.7 ml of 0.2M sodium phosphate buffer (pH 8.0) and 2 ml of 0.6 mM DTNB (prepared in 0.2 M phosphate buffer, pH 8.0. The yellow colour obtained was read after 10 minutes at 412 nm against blank. Superoxide dismutase activity was determined according to the method of McCord and Fridovich et al., 1969. 0.05 ml of the homogenate was mixed with 0.2 ml of 0.1 M EDTA (containing 0.0015% NaCN), 0.1 ml of 1.5mM NBT and phosphate buffer (67 mM, pH 7.8) in a total volume of 2.6 ml. Percent of inhibition was calculated after comparing absorbance of sample with the absorbance of the control. One way ANOVA with Post-hoc analysis was carried out. Dunnett’s test was applied to compare the dose groups with control arm. 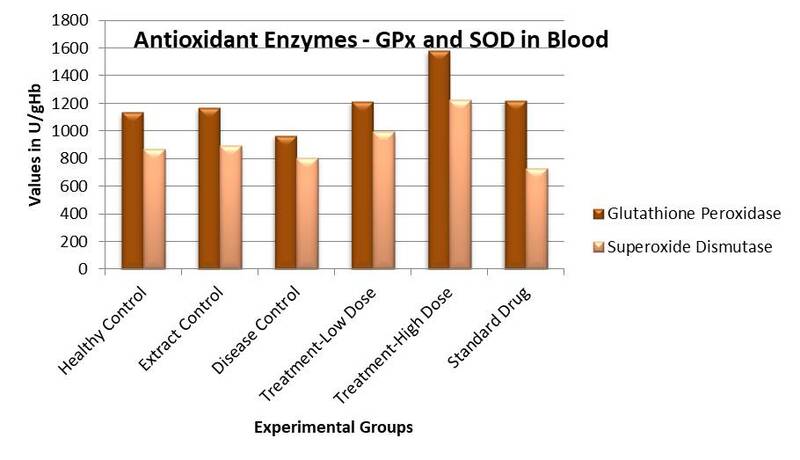 The antioxidant parameters such as Catalase, Glutathione peroxidase, Glutathione and Superoxide dismutase (SOD) were evaluated in blood samples of experimental animals. 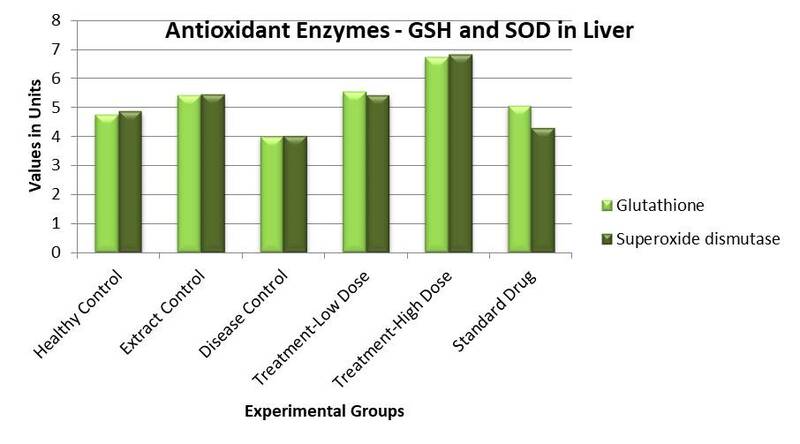 It is observed that there were enhanced levels of antioxidant parameters in Treatment group Low dose and it was not significant as compared with Disease Control and Healthy Control. 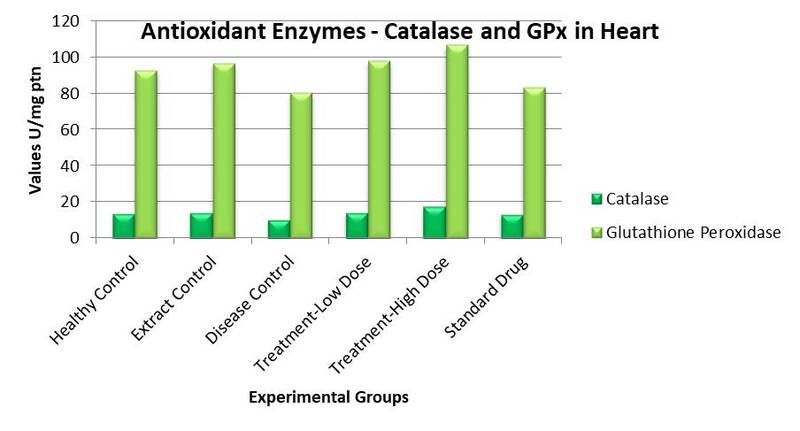 The Treatment Group High dose showed that there were significant enhancement of Catalase, Glutathione peroxidase and Glutathione levels as compared with Disease Control and Healthy Control ( p<0.01). Superoxide dismutase level is found to be increased in High dose group but was not significant. Atorvastatin treated Standard Drug group also showed elevated levels of antioxidant enzymes as compared to Healthy Control and Disease Control but it was not significant (Table 2 and Figure 1-2). The antioxidant parameters in tissue sample of Liver, Kidney and Heart were analyzed. The antioxidant enzymes Catalase, Glutathione peroxidase, Glutathione and Superoxide dismutase levels in liver tissues of Extract treated rats showed significant increase when compared with Disease Control (p<0.01). The Atorvastatin treated Standard Drug group also showed significant improvement in antioxidant profile when compared to Disease Control (Table 3 & Figure 3-4). 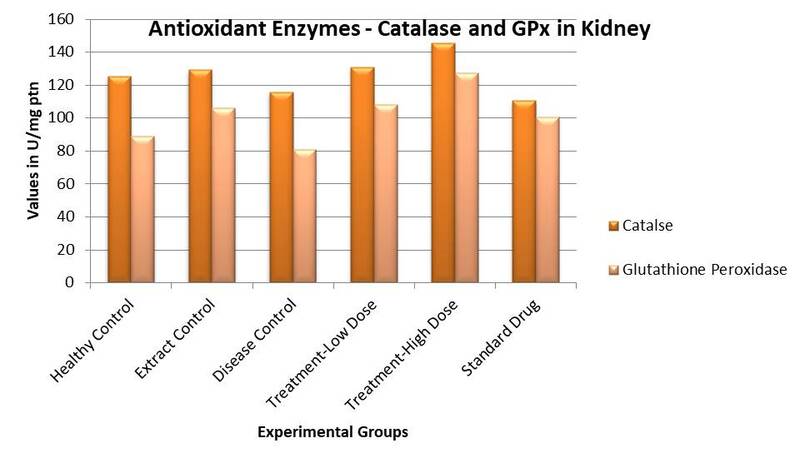 The antioxidant enzymes Catalase and Glutathione peroxidase levels in kidney tissue samples of Disease Control group showed no significant changes when compared with Healthy Control. But, the decreased levels of Glutathione and Superoxide dismutase levels were noted when compared with Healthy Control (p<0.01 and p<0.05) respectively. 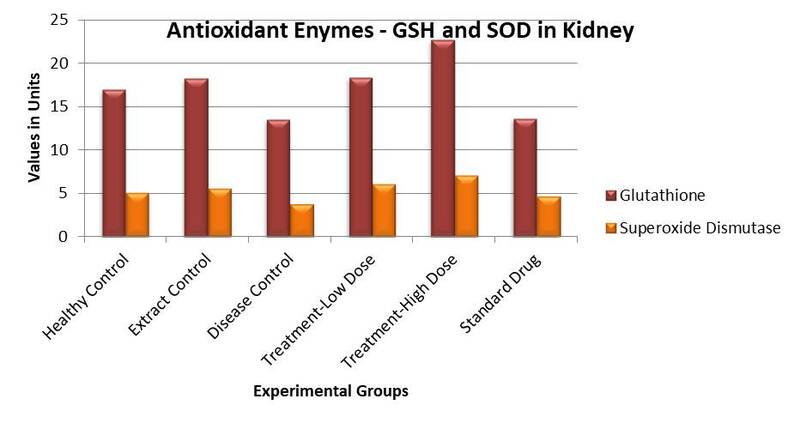 The kidney tissues of Treatment group Low dose showed there was significant enhancement (p<0.01) in Glutathione peroxidase, Glutathione and Superoxide dismutase levels but no significant changes observed in Catalase as compared to Healthy Control and Disease Control. The Treatment group High Dose showed elevated levels of all antioxidant parameters as compared to Disease Control (p<0.01) and Healthy Control (p<0.01). 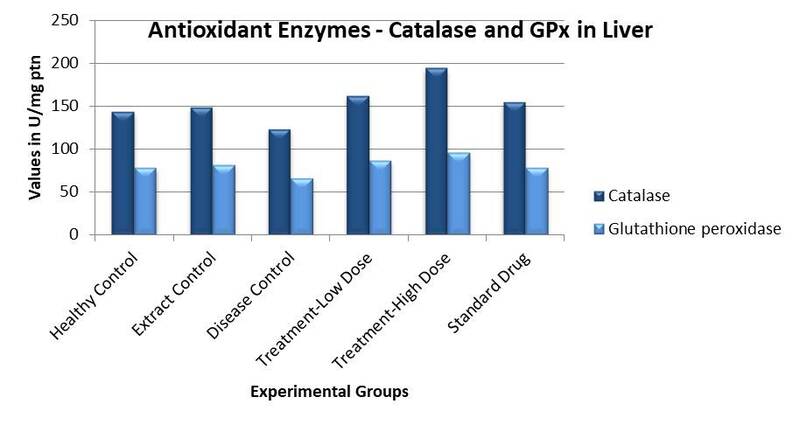 The Atorvastatin treated group showed significant variations in Glutathione peroxidase and Glutathione levels and no significant changes in Catalase and Superoxide dismutase levels as compared to Healthy Control and Disease Control (Table 4 & Figure 5-6). The antioxidant parameters such as Catalase, Glutathione peroxidase, Glutathione and Superoxide dismutase levels in Heart tissue samples of treatment groups i.e. Low dose and High dose group showed enhanced levels as compared with Disease Control group. The Atorvastatin treated group showed significant level (p<0.05) of increase in Catalase and Superoxide dismutase level when compared with Disease Control group and no significant changes in Glutathione peroxidase and Glutathione levels. (Table 5 and Figure 7-8). Table 2. Antioxidant enzyme parameters in Blood of Wistar albino Rats during Efficacy study. Values are expressed as Mean ± SEM, N=6 per group. Values with superscript a, b indicate no significant difference (p>0.05) when compared with Healthy Control, Disease Control respectively. Values with superscript a*/a** indicate significant difference compared with Healthy Control; b*/b** indicate significant difference compared with Disease Control at p<0.05 and p<0.01 respectively. The study showed that the Hydro alcoholic extract of C. halicacabum Linn Leaf has significant hypolipidemic activity in the atherodiet induced hyperlipidemia in Wistar rats. It also demonstrated that the antioxidant parameters such as Catalase, Glutathione peroxidase, Glutathione and Superoxide dismutase levels were found significantly increased in the blood and tissue samples. So, the study concluded that C. halicacabum extract has significant antioxidant potential and that must be contributing for its medicinal value. Authors are thankful to the Director General, CCRAS, New Delhi for the Intra Mural Research Project Grant. The authors also expressing the gratitude to Laboratory Technicians of Biochemistry and Pathology Department Mr. Venugopalan TN, Mr.Sanal Gopi CG, Mrs..Ranjini KR and Mrs. Neethu KR for their extended help in the study. Adeneye AA, Olagunju. 2009. Preliminary Hypoglycemic and Hypolipidemic activities of the aqueous seed extract of Carica papaya Linn in Wistar rats. Biology and Medicine, 1(1):1-10. Beers RF, Sizer IW. 1952. Spectrophotometric method for measuring the breakdown of Hydrogen Peroxide by Catalase. Journal of Biological Chemistry, 195:133-140. Bopanna KN, Bhagyalakshmi N, Rathod SP, Balaraman R, Kannan J. 1997. Cell culture derived Hemidesmusindicus in the prevention of Hypercholesterolemia in Normal and Hyperlipidemic rats. Indian journal of Pharmacology, 29:105-109. Glenson HA. 1991. Manual of Vascular Plants of Northeastern United States and Adjacent Canada. New York, USA: The New York Botanical Garden. Hafeman DG, Sunde RA, Hoekstra WG. 1974. Effect of Dietary Selenium on Erythrocyte and Liver Glutathione peroxidase in the Rat. Journal of Nutrition, 104(5):580-587. Hamden K, Allouche N, Damak M, Elfeki A. 2009. Hypoglycemic and antioxidant effects of phenolic extracts and purified hydroxyl tyrosol from olive mill waste in vitro in rats. Chemico-Biological Interactions, 180:421-432. Harman D. 1992. Role of free radicals in ageing and disease. Annuals of the New York Academy of Sciences, 673:598-620. Johnston SK, Murray DS, Williams JC. 1979. Germination and emergence of balloon vine (Cardiospermumhalicacabum). Weed Science, 27(1):73-76. Mariyappan M, Bharathidasan R, Madhanraj P, Paneerselvam A, Ambikapathy V. 2011. Antibacterial activity of Cardiospermum halicacabum and Melothria heterophylla. Asian Journal of Pharmaceutical Research, 1(4):111-113. Maruthappan V, Sakthi Shree K. 2010. Hypolipidemic activity of Haritaki(Terminaliachebula) in Atherogenic Diet induced HyperlipidemicRats. Journal of Advanced Pharmaceutical Technology & Research, 1(2):229-235. McCord JM, Fridovich I. 1969. Superoxide Dismutase, An enzymic function for Erythrocuprein (Hemocuprein). The Journal of Biological Chemistry, 244(22):6049-6055. Moron MS, Depierre JW, Mannervik B. 1979. Levels of Glutathione, Glutathione reductase and Glutathione S-transferase activities in rat lung and liver. Biochem Biophys Acta, 582(1):67-78. Patil RH, Prakash K, Maheswari VL. 2010. Hypolipidemic effect of Celastruspaniculatus in experimentally induced HypercholesterolemicWistar rats. Indian Journal of Clinical Biochemistry, 25(4):405-410. Pawan K, Dhirender K, Sukhbir LK. 2011. In vivo antioxidant activity of plant Abutilon indicum. Journal of Pharmaceutical Education Research, 2(1):50-53. Pillai NR, Vijayamma N. 1985. Some Pharmacological studies on Cardiospermum alicacabum Linn. Ancient Science of Life, 1(7):32-36. Prior RL, Cao G. 2000. Analysis of botanicals and dietary supplements for antioxidant capacity: A review. The Journal of AOAC International, 83:950-956. Romero FJ, Morell FB, Romero MJ, Jareno EJ, Romero B, Marin N. 1998. Lipid peroxidation products and antioxidants in human disease. Environmental Health Perspective, 106:1229-1234. ThamizhSelvam N, Prasannakumari K, Sanjayakumar YR, Surabi KR, Venugopalan TN, Vasanthakumar KG, Acharya MV. 2015. Evaluation of Hypocholesterimic Activity of SPHAG – A poly Herbal formulation in Wistar Albino Rats. International Journal for Pharma Sciences and Research, 6(10):1245-1249. Warrier PK, Nambiar VPK, Ramankutty C. 2002. Indian Medicinal Plants: A compendium of 500 species. Orient Longman Publications, Vol1:377-379. Yamaguchi F, Saito M, Ariga T, Yoshimura Y, Nakazawa H. 2000. Free radical scavenging activity of garcinol from Garcinia fruit rind. Journal of Agricultural and Food Chemistry, 48:2320-2325.